In June of 2002, Nai’a, the Fiji-based ship that TIGHAR has used on our last three expeditions to Nikumaroro, was supporting a survey of the Phoenix Group by marine biologists of the New England Aquarium. On June 10 or 11, the leader of the expedition, Dr. Gregory Stone, Vice President for Global Marine Programs at the New England Aquarium, was walking alone along the beach at Nikumaroro on the south side of the seaward entrance of the main lagoon passage when he noticed an unusual object in knee-deep water about 15 or 20 feet from shore. He waded out to investigate and found the object to be a “wheel rim” – the metal part of a wheel that supports a rubber tire. There was no tire present nor was there any other man-made object in the water nearby. 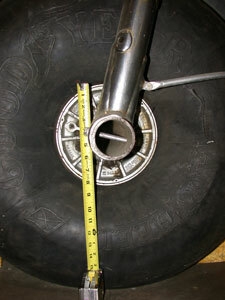 The wheel was standing on end and was roughly 12 inches across the rim and perhaps 15 inches tall. Sand covered the lower part of the wheel. No part of the wheel was projecting above the surface of the water. 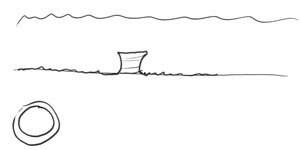 Greg reached down into the water and tried to pick up the wheel but found that it was anchored firmly to the reef surface and he couldn’t budge it. 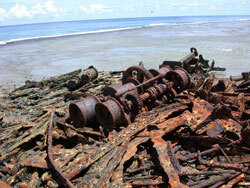 The metal was not rusty but “looked old” and was covered with a smooth coating of marine vegetation, possibly coraline algae, but not coral per se or barnacles. The top surface of the wheel featured a lip surrounding an indentation in the middle but there were no spoke-like structures apparent. 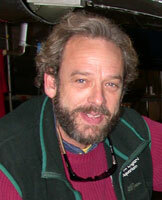 Above, Dr. Gregory Stone, Vice President for Global Marine Programs at the New England Aquarium. TIGHAR photo by R. Gillespie. Sketch drawn by Greg Stone on 12/7/02 showing the object he saw at Nikumaroro the previous June. Greg considered the wheel to be no more than a curiosity. He was familiar with TIGHAR’s work in a general sense and knew that we had made numerous searches on Nikumaroro. Because the wheel had been so easy to see from shore, he assumed that we had seen it many times. He remembers thinking, “Boy, I’ll bet that has gotten some people excited.” He had a camera with him but did not photograph the object. He vaguely assumed that it must be an automobile wheel. Nikumaroro was the first island of the Phoenix Group visited by the expedition. After three days at Niku, during which the scientists discovered a new species of Damsel Fish on the atoll’s reef, they continued on to visit Orona (Hull Island), Phoenix Island, Kanton island, Enderbury Island, Manra (Sydney Island), and then returned to Nikumaroro for two more days before beginning the one thousand mile journey back to Fiji. The incident described above happened during the initial visit to the island. Sometime during the return trip to Fiji, in a conversation with Rob Barrell, co-owner of Nai’a, Dr. Stone casually mentioned having seen the wheel at Niku. Rob, who had accompanied TIGHAR’s 1997 expedition to the island, was quite surprised and doubted that we were aware of the artifact. He suggested that Dr. Stone get in touch with TIGHAR when he got home. TIGHAR first became aware of the wheel when Ric Gillespie contacted Greg Stone in September 2002 to compare notes about the island and discuss the possibility of a joint expedition some time in the future. During the conversation Greg said, “Oh yes. There’s something I’m supposed to tell you about.”t Ric and Greg later met at the New England Air Museum in Windsor Locks, Connecticut, where a videotaped interview was done of Greg’s recollections. Ric and Greg then toured the museum looking at various wheels on airplanes, including the museum’s Lockheed 10. Greg’s impression was that the object he saw was a wheel; his sketch looks like a wheel; and his description certainly sounds like a wheel – but it is quite possible that it was not a wheel. It could be the drum of a small winch or some other object that looks similar to a wheel. There are similarly shaped larger objects among the S.S. Norwich City shipwreck debris on the reef roughly half a mile north of where Greg saw the “wheel.” However, all of the ship wreckage, except for a few brass and bronze items, is heavily rusted iron and steel. The object near the shore was not rusty and Greg, who is very familiar with the shipwreck, feels strongly that the “wheel” is not Norwich City debris. Some of the Norwich City debris resembles Greg Stone’s sketch in general shape but is much larger and rust covered. TIGHAR photo by R. Gillespie. The object could also be associated with the village that once stood near the shore on that part of the island, but the only wheeled vehicles known to have been used in the village are bicycles and a cart thought to have been used for launching a surfboat (a whale boat type of launch used for ferrying people and goods between vessels and the shore). Neither type of wheel is at all like the object reported by Greg Stone. It seems likely that there were other carts, wheelbarrows, etc. used in the village but it is difficult to imagine a wheel that would not rust. 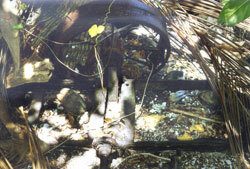 Large open-spoked wheel of cart near shore of main lagoon passage. TIGHAR photo by P. Thrasher. The U.S. Coast Guard Loran station that was located at the southeast end of the island from 1944 to 1946 had a four-wheel drive pick-up truck type of vehicle known as a Dodge WC51 Weapons Carrier. Photo courtesy RobertsArmory.com. During the Niku IIII expedition in 2001 we found a Goodyear U.S. military rubber tire in the lagoon near the village which appears to be consistent with the tires used on Weapons Carriers. The metal wheels for these vehicles were steel and of much larger dimensions than the object reported by Greg Stone. TIGHAR photo by R. Gillespie. In summary, none of the known wheels or wheel-like objects on Nikumaroro fit the description and sketch of the object reported by Greg Stone. Could It Be An Airplane Wheel? 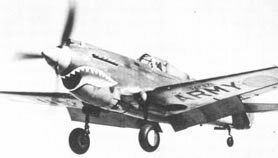 The wheels on most of the World War Two aircraft that were based on Canton Island were far too large to be what Greg saw, but even the wheels of smaller aircraft, such as those on this Curtiss P-40, right, were relatively “thin” because they were designed to retract flat into the wing. USAF photo. 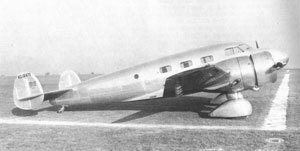 The 1937 Beech 18a, right, features “fat” Goodyear Airwheels which retract rearward into the engine nacelles. U.S. Civil Aircraft,Vol. 7. If the object seen at Nikumaroro is a Goodyear Airwheel it seems to match the dimensions of Goodyear Wheel Assembly Code #395-612. 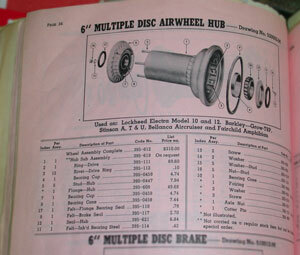 Goodyear Catalog courtesy of Chesapeake Airways, Inc.
Goodyear Airwheels and heavy duty tires were standard equipment on all Lockheed Model 10 Electras. The size was 35x15-6. The 35 refers to the uncompressed height of the tire, the 15 refers to the width across the face of the tire, and the 6 is the diameter of the opening in the middle of the tire, all in inches. Lockheed publication EE1135 revised 5/1/36. 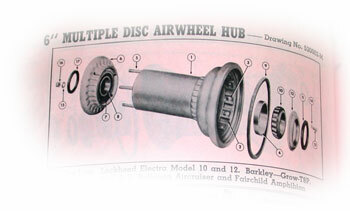 Earhart’s 10E Special NR16020 featured Goodyear Airwheels. TIGHAR collection courtesy W. Larkins. U.S. Civil Aircraft, Vol. 7. 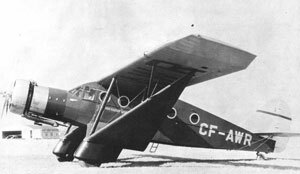 Stinson A, T & U (the aircraft pictured is an A). U.S. Civil Aircraft, Vol. 6. 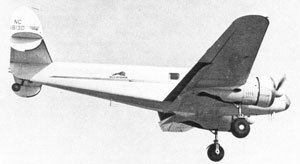 As far as we know, the only example of any of these of these types to operate in the Central Pacific region was Earhart’s Electra. Greg Stone has a clear recollection of where he was when he saw the object. He had come ashore at the blasted channel with a photographer from National Geographic and a Fijian member of the Nai’a crew who were going to try to get take some photos of coconut crabs. While the others went crab hunting inland, Greg walked northward along the shore intending to follow the coastline around to the lagoon. He was particularly interested in the lagoon’s function as a nursery for Black Tip sharks. As he remembers it, he had just rounded the corner of the passage and could begin to see into the lagoon when he spotted the object 15 or 20 feet from shore. 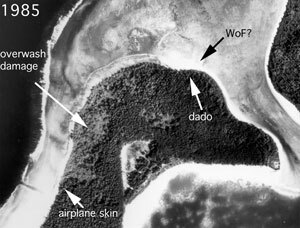 In considering the possibility that the object might be wreckage from the Earhart plane, the location described by Dr. Stone is especially interesting. 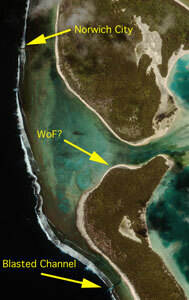 The “Wheel of Fortune” (WoF) was reportedly seen near the south shore of the main lagoon passage. Satellite photo by SpaceImaging.com. Reef analysis photos courtesy Photek Imaging. TIGHAR photo by F. Lombardo. In 1997 Jeff Glickman of Photek did a forensic imaging analysis of two photos from a series of aerial mapping photographs taken in 1953. He was seeking to corroborate anecdotal accounts by former residents of the island which described airplane wreckage allegedly seen on the reef-flat and shoreline near the main lagoon passage. 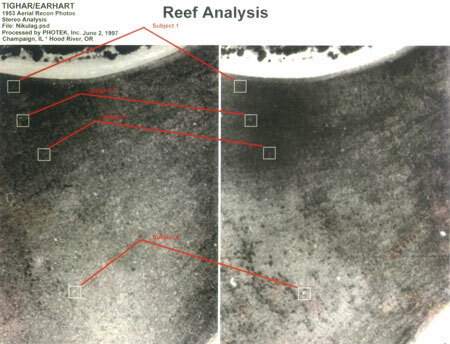 Jeff’s examination identified four light-colored objects, visible in both photos, lying on the reef-flat in perhaps three feet of water. In one photo the southern-most object is exhibiting a specular reflection typical of sunlight reflecting off metal. 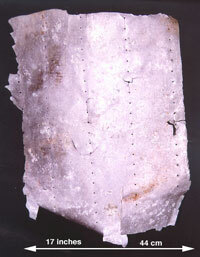 Although there is no way to know what the objects were, their appearance in the photos is consistent with a debris field of sections of aluminum sheet nominally three to four feet square – somewhat larger, but not unlike, the section of aluminum aircraft skin found by TIGHAR (Artifact 2-2-V-1) just inland from the blasted channel. Whatever the identity of the objects seen in the 1953 photos, an inspection of the passage bottom by TIGHAR divers in 1999 suggests that they are no longer there. 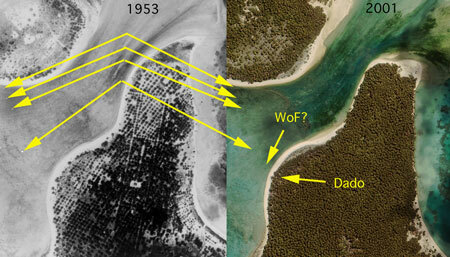 However, a comparison of the putative 1953 debris field with the location of the “wheel” indicated by Greg Stone and the place onshore where TIGHAR found another suspected Electra component – Artifact 2-1-V-8, the dado – in 1989 raises the possibility that all might be part of the same debris field. 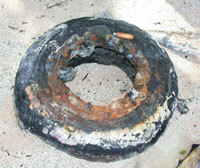 The WWII tire found in the lagoon suggests that rubber survives well in the Niku environment but no rubber was present on or near the “wheel” that Greg saw. The heavy duty Goodyear Airwheel tires were extremely durable and are not likely to have come off the wheel during the breakup of the aircraft nor could they have been cut off the rims without great difficulty. The wheel almost had to have been intentionally disassembled. It would therefore seem most likely that if the object Greg saw is from the Electra it is not simply a piece of debris that washed up but is, rather, a discarded component from a wheel and tire that washed ashore and was taken apart, possibly so that the rubber tire could be used for some local purpose. If the wheel was disassembled, the rim that Greg saw would have to be the inboard side that carried the brake assembly. The diameter of that rim is greater and more in line with what Greg remembers. The outboard rim of the Airwheel features identifying numbers and letters cast into the metal. The inboard side, unfortunately, may not. Among the tasks of the Niku Vp Expedition will be an attempt to find, examine, and – if warranted – recover the object seen by Greg Stone in June 2002. Over the years we have investigated many leads. Some have rewarded us with important new information, but most have not. It’s always easy to take incomplete information about an artifact and fill in the blanks with all the reasons why it could, or even should, be what you want it to be. This research bulletin is just such an exercise. All we can say at this point is that there appears to be more than enough reason to find out what the thing is. Does the WoF have the potential to be the long-sought smoking gun? Probably not. 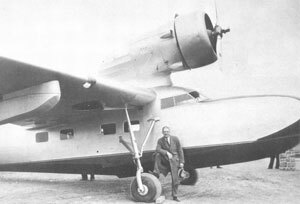 Even if the object turns out to be part of a Goodyear Airwheel of the type used on NR16020 there will be no way to be sure that it is from that particular airplane (there is no known record of the serial numbers of the wheels on Earhart’s Electra, if they had serial numbers). The fact that there seems to be no other way for such a wheel to get there would make the circumstantial case for Nikumaroro even stronger than it already is – but that’s not a smoking gun. The Niku Vp team will also conduct a reconnaissance in the overwash to assess how difficult it will be for the 2004 Niku V Expedition to run a detailed visual and metal detector examination of that area. In carrying out the recon they might come upon significant artifacts, but they probably won’t. It’s a large area. The WoF and the overwash are pieces that seem to be part the puzzle we have already partially assembled. Only time will tell if they really fit and help fill in the picture further.